It’s a strange feeling when you turn the age your parents were when they had you. (My parents were quite young, so this happened a while back for me.) Suddenly, you have a new perspective on where your mom and dad were at in life when you came along — and, maybe, how different your own life choices are by comparison. But what if you got the sneaking suspicion that your parents never wanted you? That’s the drama at the heart of The Missing One. Kali McKenzie has just lost her mother, Elena, to breast cancer. Although Kali’s relationship with Elena was distant and troubled, her death leaves Kali full of grief — and unanswered questions. While cleaning out Elena’s art studio, Kali stumbles upon a stack of mysterious postcards, each sent on the same day of the year, with an ambiguous message: “Thinking of you.” Who is Susannah Gillespie, and what is her connection with the mysterious, emotionally remote Elena, who always refused to discuss her past? On a spontaneous whim — and partly to escape her husband, whom she suspects of having an affair — Kali takes her toddler Finn and books a flight to British Columbia, where Susannah lives and works as a gallery owner. Grieving, exhausted, and barely hanging on, Kali confronts Susannah for answers, but Susannah seems to enjoy playing mind games and withholding information. Meanwhile, back home, Kali’s husband is frantic about his vanished wife and toddler, and Kali’s dad seems to think that Susannah is mad, bad, and dangerous to know. As Kali tries to untangle the secrets of her mother’s past, her quest for understanding leads to unexpected and dark places. I enjoyed the Pacific Northwest setting (it initially starts in England, but most of the action takes place in the Vancouver area and outlying islands). We love our marine environment and especially our dolphin and whale friends, and, as the original cover art hinted at, a strong conservationist and animal-rights theme emerges in the story. The stark landscape of a windswept, rocky island with perilously unreliable telecommunications is perfect for the wuthering mood Atkins is after. Whether the story succeeds as a suspenseful thriller is a different question. Kali is deeply insecure about her mothering skills, and with good reason: every five minutes, her toddler seems to be grabbing broken glass or knocking expensive art pieces off tables. Even for a person lost in grief, Kali is unbelievably incompetent, all the while insisting how capable and rational she is — we’re talking about a person who impulsively goes from England (in winter) to Canada (in winter) without bringing a coat for herself OR her child. The problem is compounded by the gothic-romance formula, which derives most of its suspense from Crucial Letters Gone Astray or Inability to Locate the One Person Who Knows the Awful Secret. Now that cellphones and GPS are ubiquitous, it’s a lot harder to be dangerously isolated, which requires Kali to be blitheringly stupid in order to get herself into various predicaments. I found it hard to have much sympathy or concern for Kali when every peril she faced was both directly of her own making and completely unnecessary. 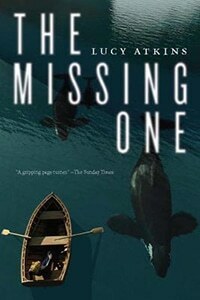 Anyway, if you’re looking to cool off at the beach with a chilly winter thriller and you’re not too picky about plausbility, The Missing One is an easy read with a simple family-drama mystery that doesn’t require close attention.